Georgia Power today marked another year of safe construction and significant milestones at the Vogtle nuclear expansion site. The new units are currently scheduled to go into service in June 2019 (Unit 3) and June 2020 (Unit 4) and the remaining projected customer rate impact is approximately 2.5 percent, an average of less than 1 percent per year through completion. In addition, the company’s recent completion of the settlement process between the project co-owners (Georgia Power, Oglethorpe Power Corporation, the Municipal Electric Authority of Georgia and Dalton Utilities) and the project’s contractors (Westinghouse and CB&I) settles all claims previously in litigation with the contractors, reaffirms the current in-service dates, adds additional contractual protections and positions Westinghouse and its affiliates as the primary contractor over the project. 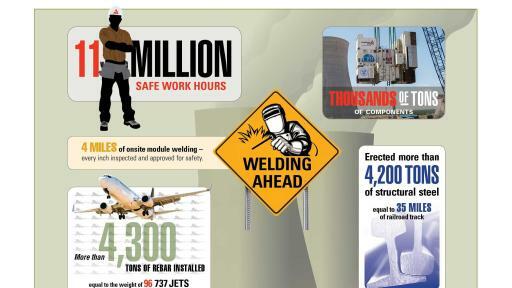 In 2015, the thousands of workers on the construction site for both units 3 and 4 maintained their dedication to quality construction and safety; logging more than 11 million safe work hours without a lost-time accident for the year. Their collective efforts contributed to the achievement of many construction milestones for the project. –June: Placement of the 32-ton CA04 module, or reactor vessel cavity, for Unit 4. –August: The heaviest “lift” of the project to date – the 1,140-ton Unit 3 CA01 module. –August: Placement of the first of more than160 shield building panels for Unit 3. –December: Placement of the 950-ton lower ring for Unit 4. –Completed nearly 4 miles of onsite module welding to exact design specifications, with every inch inspected and approved for safety. –Installed more than 4,300 tons of rebar. –Erected more than 4,200 tons of structural steel. 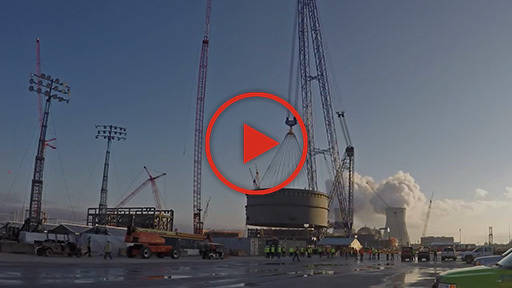 –Poured more than 26,000 cubic yards of concrete including the November 15-hour continuous concrete pour for the Unit 3 “turbine tabletop,” the first turbine tabletop placement for a U.S. AP1000 new nuclear project. Other Vogtle milestones include the rising cooling towers, which play a key role in the circulation and cooling of water used in power production. The Unit 3 cooling tower has reached its final, completed height of more than 600 feet and the Unit 4 cooling tower has surpassed the halfway mark. Along with major component deliveries to the construction site throughout the year, the project also marked significant additional achievements. In November, Georgia Power announced that, with the receipt of the final National Pollutant Discharge Elimination System (NPDES), or water discharge permit by the Georgia Environmental Protection Division (EPD), all major permits are now in place for the new units. 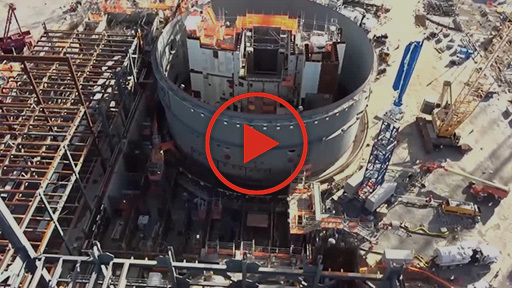 The Vogtle project continues to progress and Georgia Power has recapped 2015 milestones in its Q4 2015 Vogtle Timeline video with commentary from Executive Vice President of Nuclear Development Buzz Miller. Click here to watch the video on Georgia Power’s YouTube channel, as well as many other compelling videos from the project. 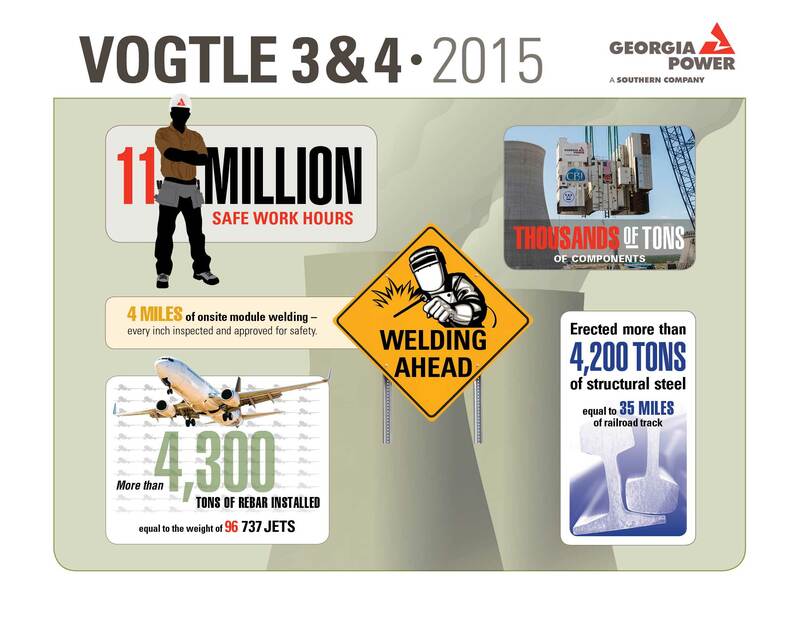 Click here to visit the online Vogtle 3 & 4 photo gallery, updated every month with the latest photos of the project. The expansion at Plant Vogtle, located near Waynesboro, Georgia, is part of Georgia Power's long-term, strategic plan for providing safe, clean, reliable and affordable energy for Georgians. Once units 3 and 4 join the existing two Vogtle units already in operation, Plant Vogtle is expected to generate more electricity than any other U.S. nuclear facility, enough to power more than one million homes and businesses. 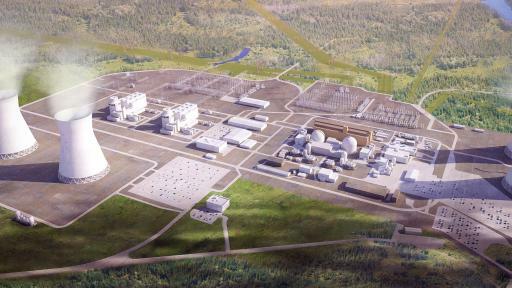 Southern Nuclear is overseeing construction and will operate the new units on behalf of Georgia Power, which owns 45.7 percent of the facility, and co-owners Oglethorpe Power Corporation, the Municipal Electric Authority of Georgia and Dalton Utilities. Georgia Power is the largest subsidiary of Southern Company (NYSE: SO), one of the nation’s largest generators of electricity. Value, Reliability, Customer Service and Stewardship are the cornerstones of the company’s promise to more than 2.4 million customers in all but four of Georgia’s 159 counties. Committed to delivering clean, safe, reliable and affordable energy at rates below the national average, Georgia Power maintains a diverse, innovative generation mix that includes nuclear, 21st century coal and natural gas, as well as renewables such as solar, hydroelectric and wind. Consistently recognized as a leader in customer service, Georgia Power was recently ranked highest in overall business customer satisfaction among large utilities in the South by J.D. Power and Associates. For more information, visit www.GeorgiaPower.com and connect with the company on Facebook (Facebook.com/GeorgiaPower) and Twitter (Twitter.com/GeorgiaPower). Certain information contained in this release is forward-looking information based on current expectations and plans that involve risks and uncertainties. Forward-looking information includes, among other things, statements concerning the anticipated schedule for completion of Plant Vogtle Units 3 and 4, and the expected impact on customer rates. Georgia Power cautions that there are certain factors that could cause actual results to differ materially from the forward-looking information that has been provided. The reader is cautioned not to put undue reliance on this forward-looking information, which is not a guarantee of future performance and is subject to a number of uncertainties and other factors, many of which are outside the control of Georgia Power; accordingly, there can be no assurance that such suggested results will be realized. The following factors, in addition to those discussed in Georgia Power's Annual Report on Form 10-K for the fiscal year ended December 31, 2014, and subsequent securities filings, could cause actual results to differ materially from management expectations as suggested by such forward-looking information: the impact of recent and future federal and state regulatory changes, as well as changes in application of existing laws and regulations; current and future litigation, regulatory investigations, proceedings, or inquiries; available sources and costs of fuels; the ability to control costs and avoid cost overruns during the development and construction of facilities, which includes the development and construction of facilities with designs that have not been finalized or previously constructed; state and federal rate regulations and the impact of pending and future rate cases and negotiations, including rate actions relating to fuel and other cost recovery mechanisms; the ability to construct facilities in accordance with the requirements of permits and licenses, to satisfy any environmental performance standards and the requirements of tax credits and other incentives, and to integrate facilities into the Southern Company system upon completion of construction; advances in technology; legal proceedings and regulatory approvals and actions related to Plant Vogtle Units 3 and 4, including Georgia Public Service Commission approvals and Nuclear Regulatory Commission actions and related legal proceedings involving the commercial parties; and the ability of counterparties of Georgia Power to make payments as and when due and to perform as required. Georgia Power expressly disclaims any obligation to update any forward-looking information.